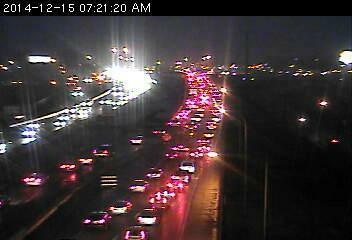 This is the scene on northbound 35E at University Avenue in St. Paul. The bottleneck is a result of two separate crashes with injuries on the Cayuga Bridge. Fire crews and other responders are on the way to sort things out. Meanwhile, a stall in the right lane of westbound 94 at Johnson Pkwy. has traffic jamming at White Bear Avenue on the east side of St. Paul. In Minneapolis, look for a stall on westbound 94 at the 394 interchange.